The significance of the April 2018 events in Armenia will become clearer in the months to come. However, the fact remains that Armenia is the second Caucasian country that has succeeded in peacefully replacing its authoritarian government following the collapse of the Soviet Union. 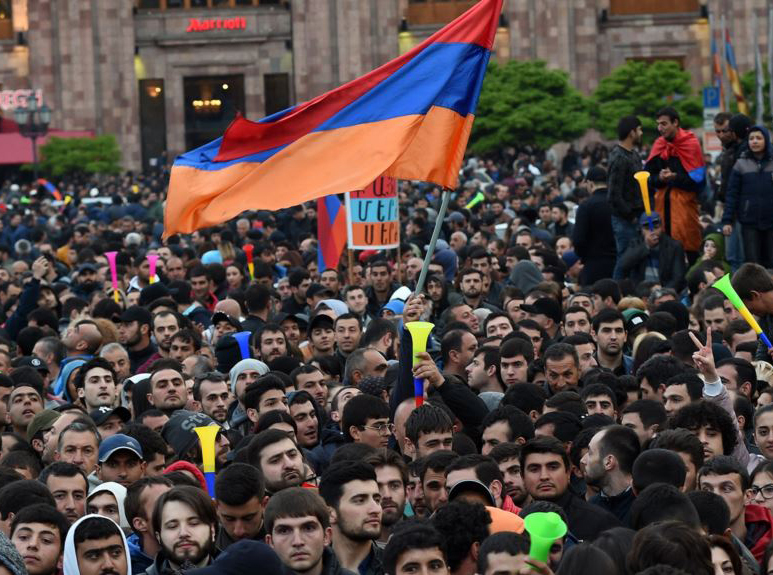 The civil disobedience campaign organized by Nikol Pashinyan, an MP from the Civil Contract party, lasted more than a month and cost Serzh Sargsyan, now former Prime Minister of the country, his position. Events in Armenia immediately sparkled speculation among political experts in Georgia, who questioned if the developments were a sign that our neighbors were changing their foreign policy and would become anti-Russian and pro-European. 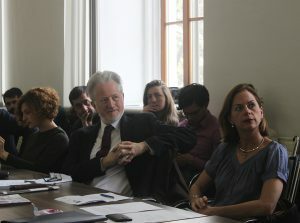 According to analyst Gia Nodia, the most popular position among Georgian social network users is “What good is all this if they do not change their geopolitical orientation?” Indeed, if Armenia does not become the second South Caucasus country to follow an openly pro-Western orientation, like Georgia did after the 2003 Rose Revolution, what benefit can these developments have for Georgia? The story is still unfolding and in the future we will witness the formation of a new Armenian foreign policy, which, apparently, could be an exact copy of the previous one. There are, however, still several reasons to hope for real change. Pashinyan’s statements about the Eurasian Economic Union and the EU. The strongest argument to bolster the hope of Georgian political experts has likely been statements by Prime Minister Nikol Pashinyan before he took office. He previously opposed the integration of Armenia into the Eurasian Economic Union (EEU). Recently, however, he changed his rhetoric and claimed that the main problem of the EEU is that it has not realized its full potential. Sargsyan was a trusted ally and a good friend of Putin. It was during his presidency that Armenia joined the Eurasian Economic Union (EEU). As Pashinyan was highly critical of this move, it was logical to assume that he would change Armenia’s policy in this direction. However, after becoming the Prime Minister, Pashinyan’s statements regarding either EEU or Russia have been mild, to say the least, if not positive, which has made prediction difficult since then. Pashinyan’s journalistic past. Although not directly connected to foreign policy, the fact that he has experienced politically motivated persecution and was in the hiding for 1.5 years due to his work as a journalist could impact his policy decisions. Considering Putin’s harsh stance against the free media, one might assume that Pashinyan would be critical towards his government style. He could make a statement similar to Emmanuel Macron, who stated that “I think he’s a very strong man, he’s a strong president. He wants a great Russia. People are proud with his policy. He is extremely tough with minorities and his opponents with an idea of democracy, which is not mine.” In reality, Pashinyan has not made a single critical statement about Russia, which leads us to the conclusion that he is not ready to play a game that pits Armenia and Russia against each other. Armenia’s new prime minister is pursuing a purely realist position, which implies that the independence of Nagorno-Karabakh, indirectly backed by Russia, is the cornerstone of Armenian national interests, around which the entire domestic and foreign policy should be constructed. In fact, he even mentioned in an interview that his movement is a purely domestic Armenian process. At this moment, their intention is to signal the regional actors that the new government is not backing down on any critical issue for Armenia. 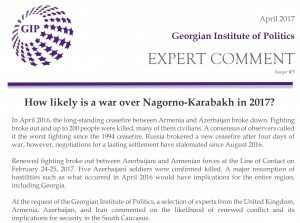 Nagorno-Karabakh conflict and Pashinyan’s position on this matter. Nagorno-Karabakh issue is not becoming any less important after the change of government in Armenia. It remains a symbol of national pride for Armenia. Considering Russia’s crucial role in the Nagorno-Karabakh conflict as Armenia’s arms supplier and political ally, it is very unlikely that a pragmatic politician like Pashinyan will try to move out of the Russian orbit and re-consider Armenia’s foreign policy. Low interest from the European Union. This has been a problem since the start of the conflict in the 1990s. The West has expressed visibly less interest in the Nagorno-Karabakh conflict, compared to other post-Soviet conflicts that involved Russia. In 1992 OSCE Minsk Group was created to encourage a peaceful resolution of the conflict. However, it has faced numerous obstacles on its way, among them the unwillingness of parties to cede. This is mostly due to the fact that Russia managed to successfully promote the image of a peacemaker, while covertly arming both sides of the conflict. In the other conflicts, such as the war in Chechnya, Transnistria or Abkhazia and Tskhinvali region, the participation of Russian militaries was far more evident and received more coverage in the international media. Russia’s leverage, especially the military bases. Russia maintains two military bases in Armenia —Russian 102nd Military Base in Gyumri and the 3624th Air Base at Erebuni. Earlier, Russia reiterated its support for Armenia in the Nagorno-Karabakh conflict: in October 2013, the chief commander of Russia′s 102nd military base Andrey Ruzinsky mentioned that “if Azerbaijan decides to restore jurisdiction over Nagorno-Karabakh by force, the [Russian] military base may join in the armed conflict in accordance with the Russian Federation’s obligations within the framework of the Collective Security Treaty Organization.” More recent developments, such as approving a bill for a credit agreement with Russia worth $100 million to facilitate the weapons purchase, also serve as a sign of Russia’s continued support. 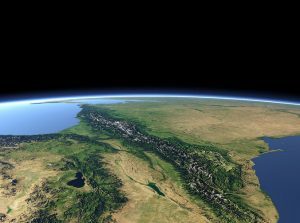 **The views and opinions expressed in this article are the author’s alone and do not necessarily reflect the views of the Georgian Institute of Politics.